Build to today's heavy single. Scheduling Reminder: We are following a Holiday Schedule today - 7:00am, 8:30am, and 10:00am classes only! Sorry no out-of-town guests today (you must be signed in on MINDBODY). We have a full house! PLEASE FIND STREET PARKING FOR CLASSES TODAY. Thanks! Memorial Day Murph on Monday! Scheduling Reminder: We are following a Holiday Schedule on Monday, May 29th - 7:00am, 8:30am, and 10:00am classes only (you must be signed in on MINDBODY)! Sorry no out-of-town guests today. We have a full house! PLEASE FIND STREET PARKING FOR CLASSES (either down Kalani Street or the metered parking along the canal as it is free on holidays). Other tenants are still open for business and we do not want you to have to move your car in the middle of "Murph." Thanks for your kokua! Wear a black 808 shirt/tank to class tomorrow (Friday) in support of our 2 teams competing at the California Regional. Plan B will be in Heat 1 and Team 808 will be in Heat 3. 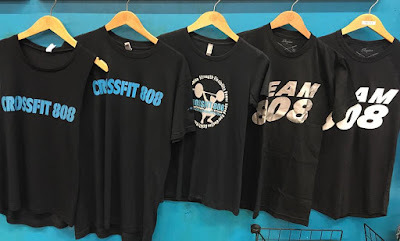 Saturday: CLOSED - tune into games.crossfit.com to watch your 2 teams! Sunday: CLOSED - tune into games.crossfit.com to watch your 2 teams! Monday: "Memorial Day Murph," Holiday Schedule - 7:00am, 8:30am, and 10:00am classes only and YOU MUST BE SIGNED IN ON MINDBODY. Sorry, no out-of-town guests today! We've got full classes. Thanks! Monday: "Memorial Day Murph," Holiday Schedule - 7:00am, 8:30am, and 10:00am classes only and YOU MUST BE SIGNED IN ON MINDBODY. Build to today's heavy over the 6 sets. Team members will alternate tasks, with only one member working at any one time. Thus, Partner A will run 400 meters, Partner B will perform 30 Box Jumps, Partner A will perform 30 DB Overhead Squats, and Partner B will run 400 meters – and so on for 30 minutes. Goal is to beat your reps achieved on April 27, 2017. A. Take 15 minutes to build to today’s 1-RM Split Jerk. REMINDER: PLEASE MAKE SURE YOU ARE SIGNED UP FOR CLASS ON MINDBODY. This is not only for class logistics, but to monitor parking as well. If your MINDBODY is not working, please make sure you email Coach Elyse ASAP (elyse@808crossfit.com). *Build over the course of the 6 sets. Important Reminder: Tomorrow, Saturday, May 13th, the parking lot will be reserved by New Hope Metro from 7:00am-5:00pm, so you must find street parking if you are coming to class. They will have a monitor overseeing the parking lot. Thank you for your help! Important Reminder: Saturday, May 13th, the parking lot will be reserved by New Hope Metro from 7:00am-5:00pm, so you must find street parking if you are coming to class. They will have a monitor overseeing the parking lot. Thank you for your help! Rest 3 minutes and repeat for a total of 4 sets.